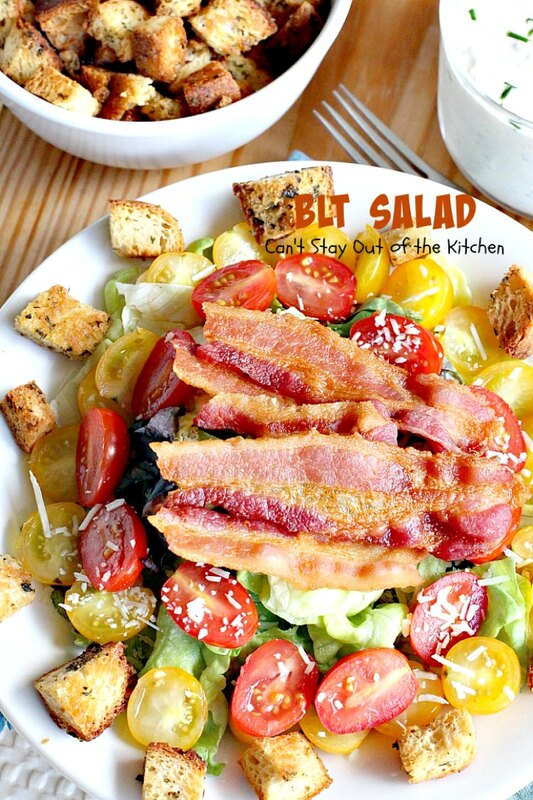 BLT Salad is one of the best salads I’ve ever eaten. We LOVED this fabulous salad and served it with a homemade Creamy Parmesan Dressing and Homemade Gluten Free Croutons. The result was spectacular and it’s really very easy to make too. 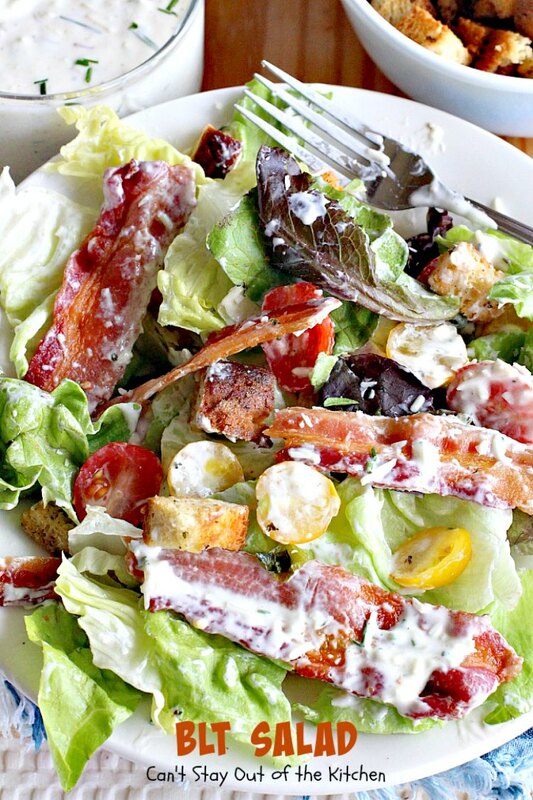 I crisp fried some of my favorite applewood smoked bacon, added butter bliss lettuce, two kinds of tomatoes, parmesan cheese, the croutons and the dressing. It is SO good and you can use it for either a main dish salad or side salad–whichever you prefer. Back in October we had friends over for dinner that we were trying to get together with for months. I served this salad with the homemade dressing and croutons. I kept everything gluten free because I was trying to eat as little gluten as possible. Although I served this as a side salad with Steaks, baked sweet potatoes, Roasted Italian Tomatoes and Fudgy Brownie Cookies, the salad and the tomatoes were the big hit of the dinner. Everyone ate two servings of this salad and the tomatoes and ate much smaller portions of the meat and sweet potatoes! BLT Salad is delightful especially if you enjoy BLT Sandwiches. This is just a greater version of it! 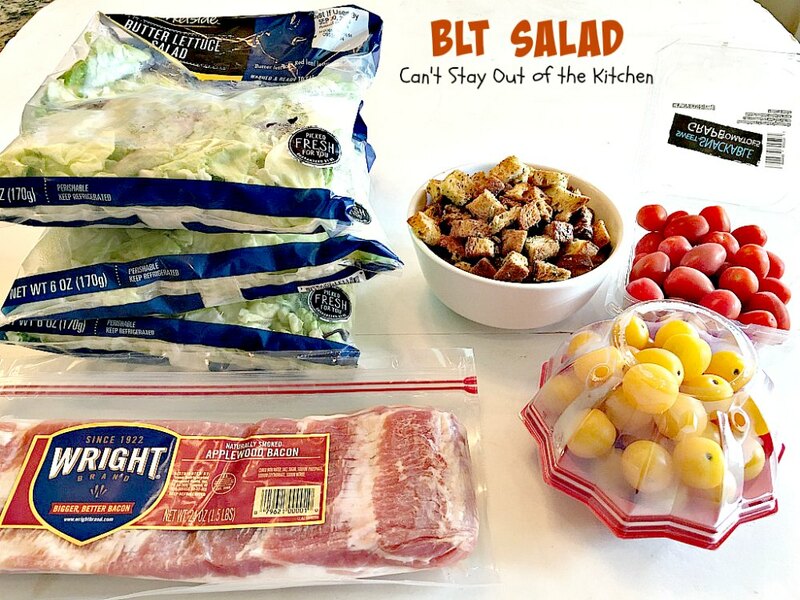 If you’re looking for a fantastic salad to serve company, or you just enjoy eating salads and don’t mind eating bacon (they do make it without nitrates and preservatives these days), then you’ve got to give BLT Salad a try. I guarantee you won’t have hardly any leftovers because everyone will keep going back for more! 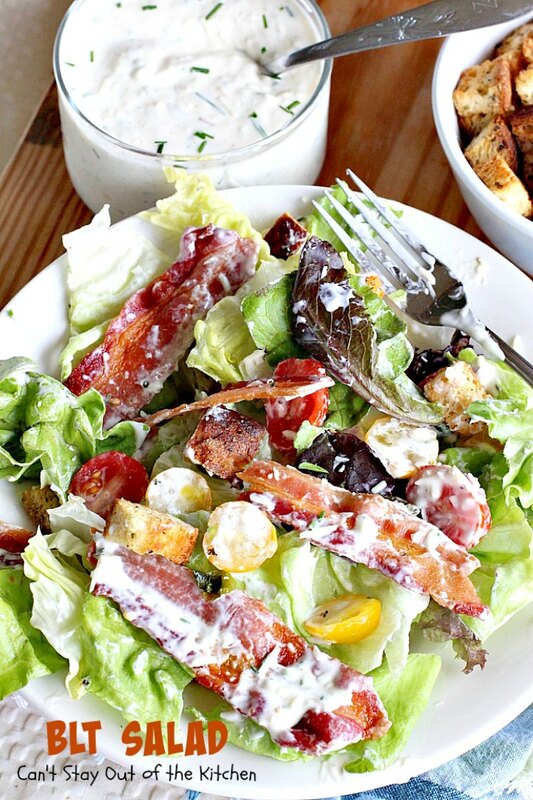 BLT Salad with Creamy Parmesan Dressing and Homemade Gluten Free Croutons is spectacular! Stir Creamy Parmesan Dressing into salad, toss with croutons and enjoy! 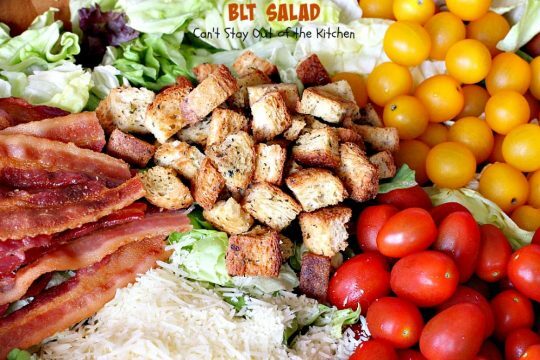 BLT Salad is wonderful served as a side or main dish salad. Use turkey bacon if you can’t eat pork. I used these ingredients plus parmesan cheese. Layer butter bliss lettuce in a very large salad bowl. 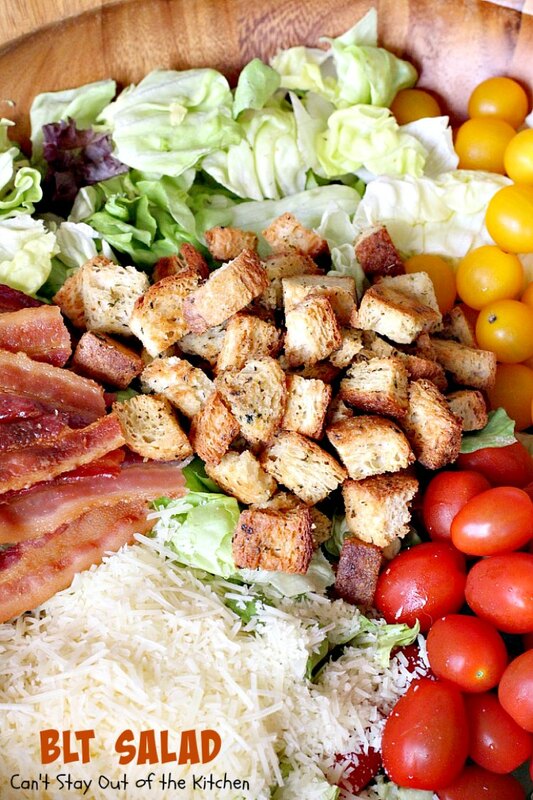 Add grape tomatoes, yellow sunburst tomatoes, parmesan cheese, crisp-fried bacon and Homemade Gluten Free Croutons. (Unless you are going to be serving immediately, don’t add croutons. Cover salad and refrigerate. Leave croutons out on the counter until ready to serve). I also recommend breaking the bacon into one to two-inch pieces as it’s much easier to eat that way–especially if you’re eating a thick-sliced bacon like this. 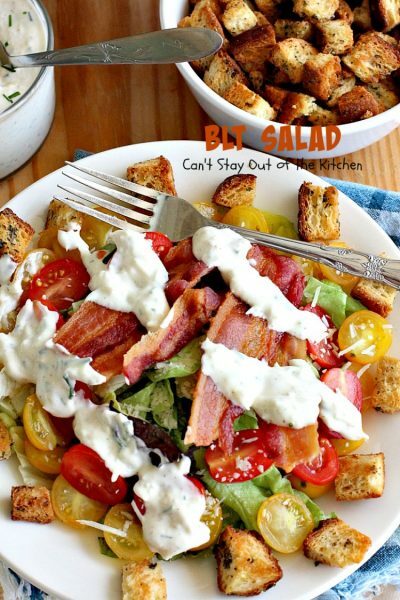 BLT Salad will soon become one of your faves. It’s THAT good! While I didn’t break the bacon pieces into one-to two-inch pieces before serving. I recommend it as it’s easier to eat the bacon that way. The combination of flavors–especially adding parmesan cheese to the salad and to the dressing is phenomenal. 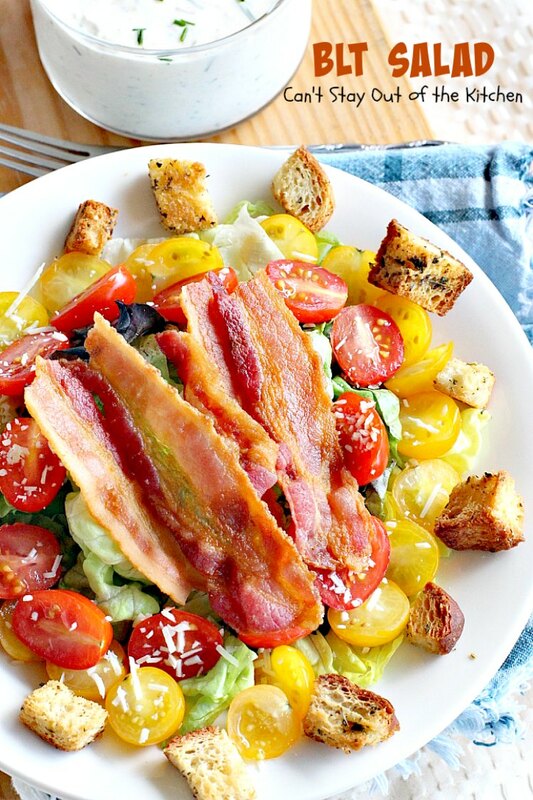 Fabulous Bacon, lettuce and tomato salad includes parmesan cheese, homemade gluten free croutons, and a homemade Creamy Parmesan Dressing. Great for a main dish or side salad. Gluten free. Layer salad, tomatoes and parmesan cheese in salad bowl. Toss with Creamy Parmesan Dressing before serving. NOTE: Do not refrigerate salad with croutons on top. Allow the croutons to sit out on the counter or they may get soggy. Add croutons just before serving. NOTE: While I didn't break the bacon into 1 to 2-inch pieces before serving, I recommend it as it's easier to eat the bacon that way. Recipe adapted from Natasha's Kitchen. If you enjoy Bacon, Lettuce and Tomato sandwiches, you’ll love this amazing salad!